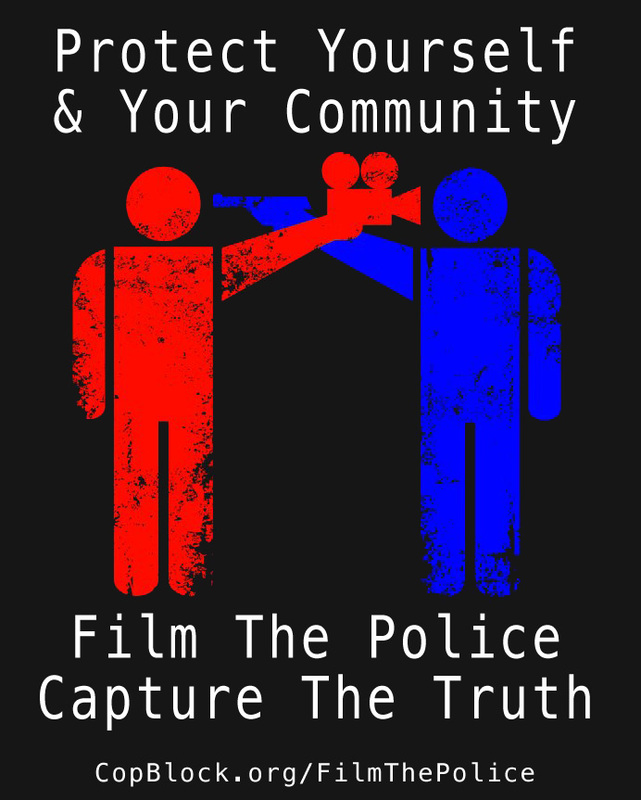 Documenting the actions of police employees can help protect you and others because it creates an objective record. 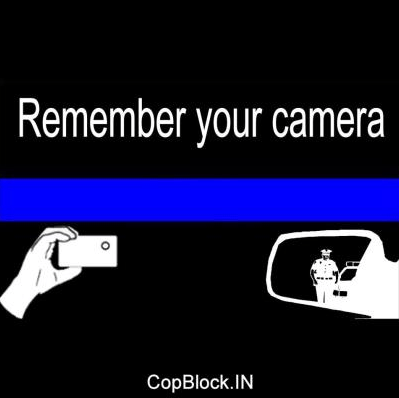 You have the right to record anything in public – including, and some would say, especially – police employees. Though police employees are people just like you and me, courts have ruled that police can lie to you, and that they may not be held accountable for their actions per unfair legal doctrines and practice like “sovereign immunity” and “acting under color of law”. Recording your interaction preserves the truth for anyone to see. The camera is the new gun. It is the great equalizer. Film the police! Have the proper mindset. Treat each police interaction as a hostage situation. By remaining calm, cool, and collected, it will help to defuse, rather than aggravate things, and thus increase the likelihood of a good result. Know that anything can happen during police interactions. Consider possible scenarios and try to mentally prepare yourself in case you are confronted by a hostile police employee. Ultimately, how others perceive and react to your recording of the police interaction is contingent on the individuals involved. How often others in the region film the police also plays a factor – the more common is the practice, the more likely the police will react in a neutral or even positive manner. You can choose to remain silent – that’s your right. Know that the police employee may tell you’re “interfering” with the scene, and demand that you move away. Whether you choose to back up or not, panning down with your camera to show your feet, and the distance to the ongoing stop, can help put things in perspective. When doing that you may want to verbalize an estimate of the distance between yourself and the police officer to emphasize that you are not in fact interfering. Handling an interaction in this way – responding to questions with open-ended questions, is a powerful way to disarm the police employee (though keep in mind that police employees can and do lie so the response given may be misdirection). 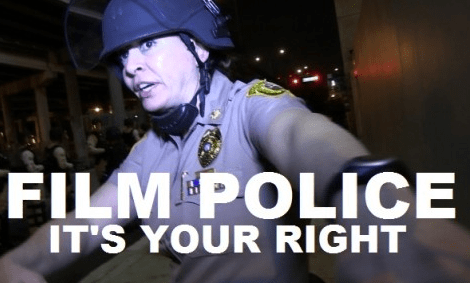 Ending with “Am I being detained or am I free to continue documenting the truth?” gives them a choice – they can choose to knowingly violate your rights (on video) or they can choose to not interfere with your right to record. A police employee may harass, issue ransoms to, and cage, you simply for not obeying. Even if you do nothing wrong, hostility from strangers who sees themselves as “authorities”, and who are treated by others as such, based simply on their attire, may result in physical force. In such unfortunate and unnecessary situations, remember that the police employee is the aggressor, not you. It can be empowering to know that you did nothing deserving of such treatment, it can can be very empowering. Instead of apologizing, or taking a plea deal, or funding their outfit, you can choose to stand on your conscience and speak the truth. If the situation gets really out of hand, and you’re in fear of death, you absolutely have the right to defend yourself. However, if the unjust action isn’t putting your life or that of another in jeopardy, continue to stay as calm as possible, and vocalize what’s happening. Your narration will communicate powerful information to later viewers (whether they are internet users or jury members) as to who was the actual aggressor. Some people are under the misconception that it’s illegal to film the police in certain places. That is patently false. You have the right to video record anything in public in any geographical location. 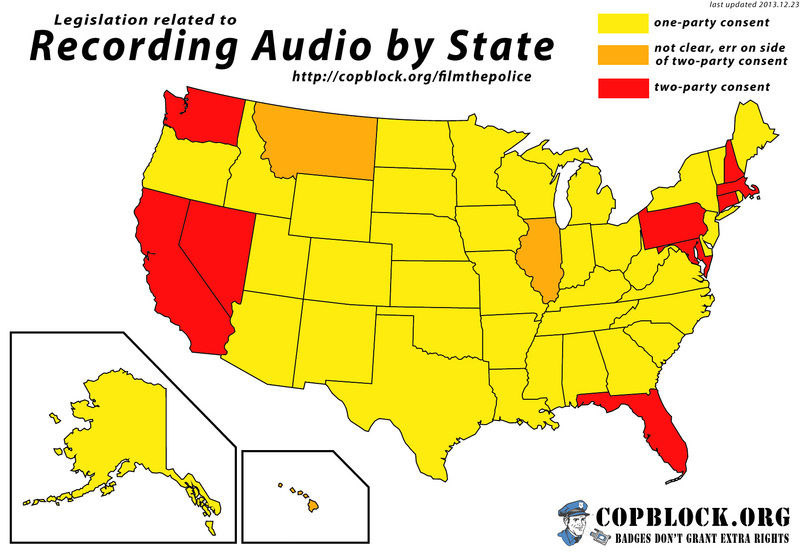 Restrictions related to the recording of police employees (and others) are related to the capturing of audio. And police and prosecutors, in an effort to deter those they claim to serve and protect from documenting their actions, have been known to levy charges based on antiquated wiretapping legislation. So, do yourself a favor – don’t give the would-be censors any room to levy such accusations. If you’re in a two-party consent state or a place where the legislation isn’t too clear and you’re recording, inform the other parties present. Some suggest that even if you’re in a one-party consent state that you inform the others present as it usually helps to change the dynamic of the situation for the better (as those being recorded both see your recording device and hear you vocalize that recording is happening, which can deter aggressive behavior). Get a recording device and use it! An audio recorder is good – they’re inexpensive and small, making them easy to always carry or to conceal. You may want to attach it to a lanyard and have it around your neck, or keep it in your breast pocket, so should you see some police activity, you can start recording. A video camera is better – whether an expensive consumer-pro high-definition camera or the video function on a point-and-click camera, capturing audio and video is huge. A solid hand-held video camera can be gotten for around $200. Many decent options cost less than $100. Or you could even use the video recording feature on an old point-and-click camera. 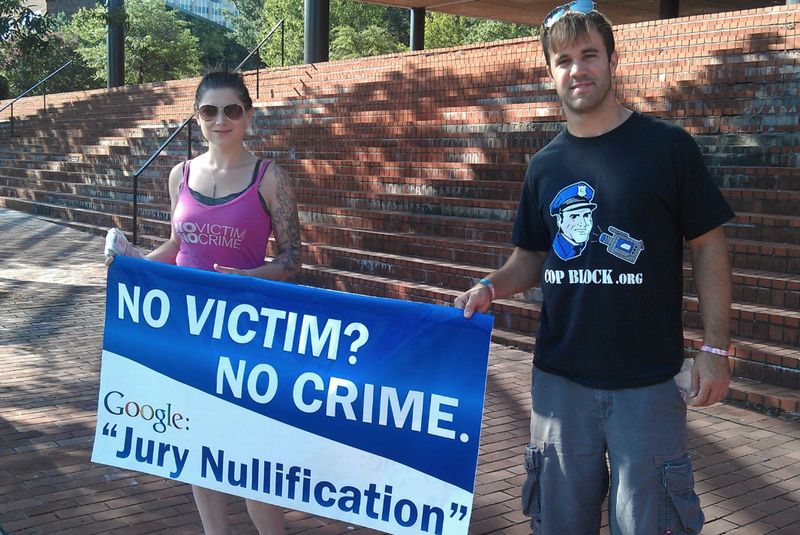 For more on these streaming apps, and for other smartphone apps, see: http://copblock.org/apps. Become familiar with the functionality of your recording device. During a police encounter you may be under more stress, or in a low-light situation, or you may want to record covertly, so, as basic as it sounds, practice with its operation. This will give you peace of mind and help to ensure that you’re actually recording when you want to be recording. Know the limits of your recording device. How long can you record for after a full-charge or new batteries? How much content can you fit on the internal memory or on your SD card? Note that the resolution size of the content captured will impact the length of recording possible. If a devious police employee deletes footage you captured, or if you yourself accidentally delete a needed recording, there’s a good chance it can be recovered – but be sure not to use the device to record again until you’ve extracted the deleted content successfully! Essentially, deleting a file from your device merely removes it from the file directory, without which, the file won’t appear. When you run a software recovery program it will scrape all video content from the destination you indicate (the internal memory of the device or the SD card). The recovery program is not a laser – you can’t search for a specific file. Instead, it operates like a vacuum, sucking all content from the destination. There are many software recovery programs, some are listed below. Note that some of the free versions recover only up to 1GB. If you try one and it doesn’t return the deleted content you hope to recover, don’t be deterred, just try another. Have patience for this process, as, depending on your drive size, it could be time-consuming.